Natural Fertility Consultation? Why You Should Consider One! Consider the benefits of booking a Natural Fertility Consultation today! Are you feeling like you have no idea where to begin; feel you need to make changes in your life to improve your fertility? Maybe you have made some natural fertility changes, but are wondering if supplements or herb choices are right for you. A Natural Fertility Consultation is the cornerstone of your Natural Fertility Program. Our goal is to help you achieve a healthy, fertile body. Our Natural Fertility Consultation will provide you with a road map to the best natural therapies, herbs, supplements protocols for your unique fertility needs. Are you wanting to prepare for your upcoming IVF, or wanting to boost your overall fertility in preparation for pregnancy or desiring to learn how to support uterine, ovarian or fallopian tube health? 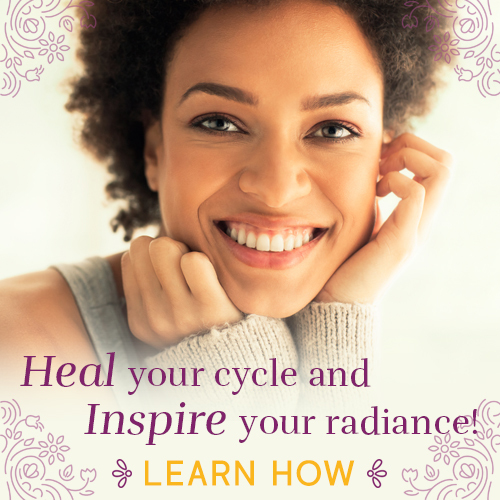 Maybe you would like learn more about charting your cycle and how your cycle affects your fertility. If so, our Natural Fertility Consultation can help. Help to identify areas in your life that may be negatively impacting your fertility with information on what can be done to positively change those areas to create optimal fertility in preparation for pregnancy. Support and direction on fertility testing and how to communicate with your healthcare provider so you can make the most informed decisions about your health. Programs to get you pregnant! After filling out the form below, you will be brought to the scheduling page where you can schedule your consultation. You will be forwarded an intake form that we will use when we meet. We will meet via the way that works best for you. After we meet, you will be forwarded the road map we have talked about with specific guidelines for your goals and health needs. You will have the opportunity to do a more in-depth follow and programming so you can have more support after our consult. Book your consultation below! We look forward to hearing from you and helping you to develop a plan for optimizing your fertility and on your way to a healthy, happy pregnancy! 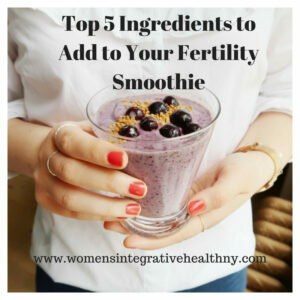 Top 5 Ingredients For Your Fertility Smoothie! Looking for a way to boost your fertility naturally? 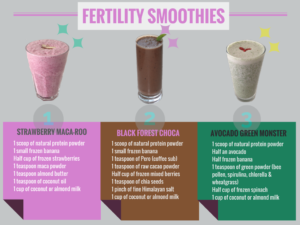 One of the top 10 fertility boosters is an easy to make Fertility Smoothie. No matter if you are just beginning to learn about a Fertility Diet or if you have eaten a healthy, whole food diet for years, consider making a Fertility Smoothie part of your daily routine. They are a fun, delicious way to consume a huge amount of nutrients including vitamins, minerals, antioxidants, omegas and fiber in an easy to digest form. 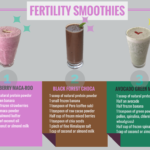 what makes a smoothie a fertility smoothie? The bulk of the smoothie should come from raw, fresh whole fruits and vegetables (frozen works also) with a nutritious liquid added to them to achieve the perfect consistency. To turn your smoothie into a fertility smoothie, add superfoods known to boost fertility, along with protein and healthy fats to make the smoothie a balanced meal. There are five ingredients that can turn your typical smoothie into a fertility boosting powerhouse by increasing the nutritional value. Fruits and Vegetables: Because they are packed with vitamins and minerals, antioxidants, enzymes and fiber, fruits and vegetables are essential to healthy fertility. Any raw fruit would do. Popular fruits are berries, mangoes, peaches, apricots, pineapples and bananas. As for vegetables, add a big handful of dark green leafy vegetables like spinach and kale, or try adding pureed carrot, sweet potato or squash. Another way to “eat your veggies” could be through just two teaspoons a greens powder. These greens powders contains mixtures of dried powdered leafy greens, wheat grass, spirulina, barley grass, with the added bonus of nourishing herbs. Look for an organic brand. Protein: Men need to consume 52 grams of protein daily and women need at least 46 grams of protein every day. That number increases greatly for women in pregnancy (80-90 grams a day). Protein added to a fertility smoothie can support balanced blood sugar levels and sustained energy levels. Great sources of protein are whey, nut and seed butters and spirulina. The blue-green algae spirulina is considered the highest quality plant protein available. It also provides a number of vitamins and minerals. FertilWhey protein powder is another excellent choice because it is derived from grass-fed cow’s milk, and is minimally processed. This means the whey in FertilWhey maintainsthe full range of fragile immune-modulating components naturally found in fresh, raw milk. Just one scoop contains 16 grams of protein, helping you to meet your daily protein requirements. Good Fats & Omega 3’s: Healthy fats support proper immune system function and a healthy inflammation response. Fat is also essential in helping the body manufacture hormones. Try canned organic coconut milk (full fat) or refined organic coconut oil, avocado, organic raw full fat dairy (milk, yogurt, kefir) and hemp, chia or flax seeds. Fertility Boosting Facts: Hemp, Chia and Flax seeds are excellent sources of fiber, protein and maybe most importantly omega-3 essential fatty acids. Omega-3s help the body regulate hormones and inflammatory response, increase cervical mucous production, promote ovulation and increase circulation to the reproductive organs. 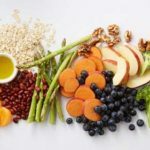 Fertility Superfoods: Superfoods should be a part of every couple’s fertility diet to help bridge the gap for proper nutrition, nourish the egg and the sperm and help to balance hormones. An easy way to get fertility superfoods into your diet daily is to drink fertility smoothies. Maca contains a variety of micro-nutrients. It is considered foundational for improving hormonal balance, energy levels, and libido. It is extremely useful for those experiencing high stress levels. Royal Jelly has a superior nutrition profile containing amino acids, lipids, vitamins, sugars, proteins, fatty acids, iron, calcium and Acetylcholine (which transmits nerve impulses from cell to cell). It is beneficial for men and women with a hormonal imbalance of any kind. Because of its high nutritional content we use it as part of our protocol to improve sperm and egg health and to encourage healthy endocrine and immune system function. Wheatgrass is one of 5 Fertility Superfoods because it aids the body’s natural detoxification processes and purifies the blood. 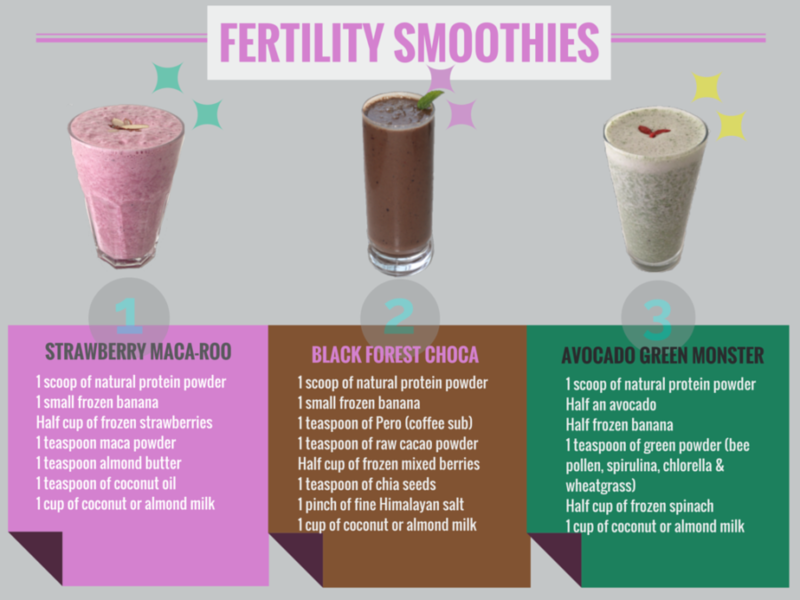 Fertility Smoothies – best way to prepare for a healthy pregnancy! This is a great fast fertility food and you will probably end up craving! Get your copy of Your Nutritional Guide to Healthy Fertility by filling out the form below. It includes recipes and many nutritional guidance and meal planners, snack recipes a fertility food checklist. For Your Free Yoni Resource – Fill out the form below. You will automatically be brought to your FREE Yoni Guide. Now is an exciting time for women as we reclaim our collective power – over our bodies, our narratives and ultimately our place in the world. In this juicy guide, you will learn. . .
You will be able to order the herbs right from this guide. Now how vaginal steams can heal your cycle! Vaginal steams (bajos in Spanish) have a long history of use by traditional healers in various parts of the world. Vaginal steams are very beneficial for a wide variety of conditions, from painful menstrual cramps to infertility. They can help the http:// uterus empty itself more completely, dredging out old tissue and blood that may have been there for months or even years. Vaginal steams are easy to do on your own at home. Steams can assist in healing a wide variety of gynecological issues. They are effective at enhancing fertility, and assisting in postpartum recovery. For fertility, do them the week before menstruation and again just before ovulation. What to expect: You should expect changes in your vaginal discharge and menstruation; these are normal cleansing reactions and a good sign that waste material is being removed from your womb. Use 1 quart fresh herbs or 1 cup of dry. 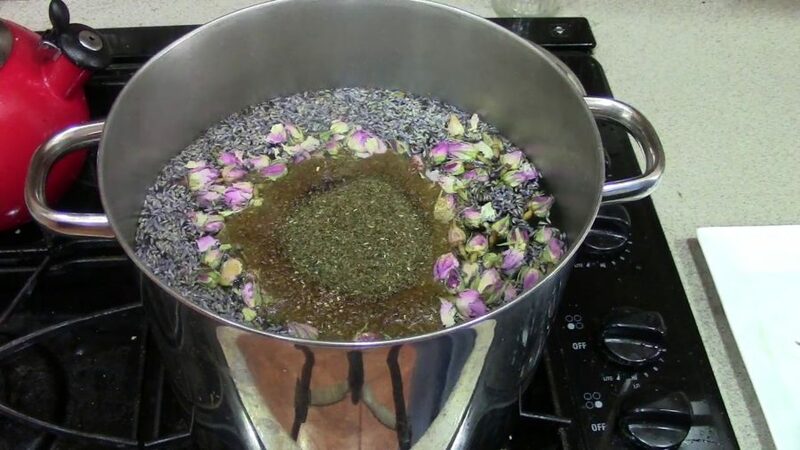 Herbs used for steams are generally those that are very aromatic and always non-toxic. 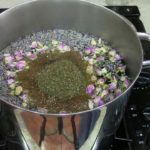 The list of herbs is not meant to be a complete list of every possible herb you can use; they are some of the most commonly recommended herbs for steams. These are generally easy to find – they can be purchased in bulk at a local health food store or herbal shop. The herbs can be used dried or fresh. Never use essential oils in vaginal steams. Always choose organic or wild plants when possible. These recommendations are to be used with vaginal steams only and not internally. Motherwort: Tonifies the reproductive system and increase circulation to the pelvis. Balances hormones. Mugwort: Cleansing-physically ad spiritually. Balances hormones. Can help bring on menses. Yarrow: Astringent. Cleansing. Anibacterial. Good for infections. Oregano: One of the top herbs for steams. Best herb to bring on menses. Uterine stimulant. Increases low, inadequate menstrual flow. Antiseptic. Prevent infections. Lavender: super relaxing herb, calms the spirit, mind and body. Antispasmodic. Nourishing to the nervous system. Emollient, very soothing to irritated tissues. Marigold/calendula: Cleansing, induces perspiration of tissues. Very healing for irritated skin or scars. Activates the lymph. Gentle energy. Rosemary: Increases circulation to the pelvis, clears out old blood and fluids. Antiseptic and very cleansing. Brings concentration and focused energy. Sage: Astringent. Spiritually cleansing. Release emotional and energetic blockages. Basil: Can bring on menses. Reduces menstrual cramps. Antibacterial. Blesses the woman receiving the steam. Spiritually cleansing. Rose petals: Relaxing and uplifting. Mildly astringent. Increases self love, releases stuck emotions. Chamomile: Relaxing, calms the mind. Soothing to the vaginal tissues. Anti-inflammatory. Long/Irregular cycles: Oregano, basil and mugwort. Helps bring on the blood. Scanty bleeding: Rosemary, oregano, and motherwort. During the last week of the cycle. Painful menstrual cramps: Motherwort, basil and lavender. During the last week of the cycle. Enhance fertility: Oregano, motherwort, rosemary. Steam 3 days starting at the end of menstruation. Repeat the last week of the cycle. PCOS/Ovarian cysts: Rosemary, motherwort and lavender. Endometriosis: Oregano, motherwort, yarrow, and rose petals. Fibroids: Motherwort, basil, sage, oregano and calendula. Can be done every 2 weeks, but contraindicated if there is very heavy flooding menses. Adhesions/blocked fallopian tubes: Oregano, rosemary and mugwort. Bladder/Vaginal infections: Yarrow, oregano, lavender and calendula. Steam 2 days, wait a few days, if symptoms persist, repeat. If symptoms worsen, discontinue. Postpartum: Oregano, calendula, motherwort and basil. Steam 3 days within 9 days of the vaginal birth. Okay if bleeding. Check with practitioner first. Wait at least 6 weeks after a c-section birth. Perineal tear/scars/episiotomy: Calendula, lavender, yarrow. Wait till wounds are closed and stitches have been removed. Menopause: Rosemary, oregano, motherwort. Steam several times after the end of they cyclical bleeding. Helps empty out the uterus completely before bleeding stops for good. Menopausal dryness: Lavender, calendula, chamomile. After you have chosen your formula, 1 – quart fresh herbs or 1 cup dry herbs, place herbs in a pot of lukewarm water with the led on the pot. The following day, bring a gentle simmer for 20 minutes and then let steep for 25 minutes with lid on. Set your space, turn off your phone, put music on, grab a favorite book, light incense or candles, make a cup of your favorite tea. Place the pot under a slotted chair, step stool with a slot, lawn chair or water bath canner with a wooden toilet set on top. Remove your clothes from wait down, leaving socks on and keeping your upper body warm. Sit on your designated seat over the steaming herbs and drape your lower body with blankets that extend all the way to the floor to ensure the steam is contained and directed upward. The steam bath will introduce a lot of healing heat to your labia, vaginal canal and the to the womb. If necessary, create a small vent to allow excess steam to escape, it should feel pleasant. Sit over your steam for at least 20 minutes. Simply enjoy the healing and nurturing time you have set aside for yourself. Rest quietly after the steam in a warm room, free of drafts, open windows or air conditioning for at least 20 minutes. When you get up, dress warmly and protect yourself from cold drafts or sudden temperature changes for 24 hours. Release the herbs and water back to the earth giving thanks for supporting your healing. For more help with hormone balance, contact us below. These items can be consumed liberally if you are eating Gluten Free. (go organic and local with your whole-food choices wherever possible, flash frozen is fine also). Protein: whole eggs, wild fish (salmon, black cod, mahi mahi, grouper, herring, trout, sardines); shellfish and molluscs (shrimp, crab, lobster, mussels, clams, oysters); grass-fed meat, fowl, poultry and pork (beef, lamb, liver, bison, chicken, turkey, duck, ostrich, veal); wild game. Herbs, Seasonings, and Condiments: There are no restrictions on herbs ad restrictions on herbs and seasonings; be mindful of packaged products that were made a plans that process wheat and soy. 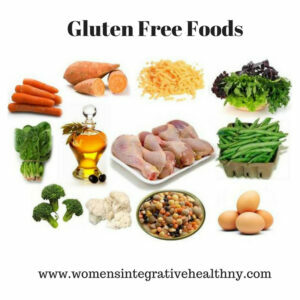 Non-gluten grains: amaranth, buckwheat, rice (brown, white, wild), millet, quinoa, sorghum, teff. (A note abut oats: oats do not naturally contain gluten, they are frequently contaminated with gluten because they are processed at mills that also handle wheat; avoid them unless they come with a guarantee that they are gluten-free.) When non-gluten grains are processed for human consumption (e.g., milling whole oats and preparing rice for packaging), their physical structure changes, and this increases the risk of an inflammatory reaction. For this reason, we limit these foods. Legumes (beans, lentils, peas). Exception: you can have hummus (made from chickpeas). Whole sweet fruit: berries are best; be extra cautious of sugary fruits such as apricots, mangos, melons, papaya, prunes and pineapple. Cow’s milk and cream: use sparingly in recipes, coffee, and tea. Cottage cheese, yogurt, and kefir: use sparingly in recipes or as a topping. Sweetners: natural stevia and chocolate (choose dark chocolate that’s at least 70 percent or more cocoa). Wine: one glass a day if you choose, preferably red. Here’s a beginning of helpful foods to get you started. For help and other resources, contact us! Hormonal balance is an important factor when it comes to healthy fertility and getting pregnant as well as feeling balanced overall. 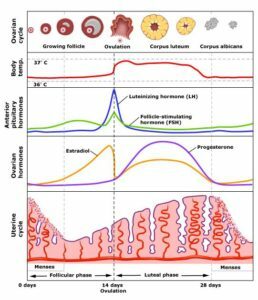 During the course of a menstrual cycle various hormones are working together in a complex symphony to trigger the various components of ovulation and menstruation. Progesterone is one of these key hormones. 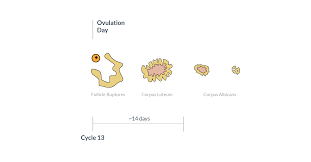 After ovulation, progesterone production is triggered by Luteinizing Hormone (LH) which stimulates the corpus luteum (remanant egg sac) in the ovary to produce progesterone. If pregnancy occurs, the production of progesterone from the corpus luteum continues for about 7 weeks (it is then produced by the placenta for the duration of the pregnancy. If pregnancy did not occur, the period begins 14 days after ovulation. When fertilization does not occur the corpus luteum disintegrates, which causes the level of progesterone to fall and the endometrial tissue to disintegrate and shed as menstruation. Are Your Progesterone Deficient or Estrogen Dominate? Pollution and stress mimic estrogen at the estrogen receptor sites. Eating a large amount of processed soy products can also mimic estrogen. PCOS and endometriosis can also have an estrogen dominate action. There are many signs that may show up in the body if you do not have enough progesterone in your system during the correct times of your cycle. You can use this checklist as a guide for determining estrogen dominance or progesterone deficiency. There are a couple of test options. Tests range from charting your menstrual and basal body temperature, finding out the length of your luteal phase taking a saliva or blood test to find out your progesterone levels. The questionnaire above will help to point out signs of progesterone deficiency while tests help to confirm it. Basil Body Temperature charting can help to determine the availability of progesterone in the luteal phase. There will be a slight rise in temperature after ovulation has occurred and progesterone has increased. If the date of ovulation is fewer than 11 days before your period, this could suggest luteal phase defects. You can detect ovulation using BBT charting, OPK strips. Saliva tests are better for testing progesterone and estrogen levels. You can order an “at home” saliva test that you will take at a certain time during your cycle and then send away to a lab for analysis. They will mail you back the results so you can find out if you have any hormonal imbalances. You can find more info on hormone testing here! Contact us if you would like some help determining which tests to do and with help for deciphering your results and how to correct any imbalance. We have become an estrogen dominate society from all the excess estrogen in our foods and environment. Go here for more help with reducing toxins in every day living. Vitex is one of the most powerful herbs for women’s fertility and menstrual health. Vitex supports hormonal balance in the body by having an effect on the hypothalamic-pitituitary-ovarian axis (hormonal feedback loop), correcting the problem at the source. Vitex works slowly to normalize the body. Maximum benefits are often achieved after 6-12 cycles with vitex. Natural progesterone cream can help to supplement your body’s own progesterone levels and lead you back to a state of natural balance. Natural progesterone cream comes from plant fats and oils called diosgenin which is extracted either from Mexican Wild Yams or soybeans. Application through the skin has been found to be one of the most effective ways to use natural progesterone. It is absorbed through the skin into the underlying fat which helps to slowly allow progesterone into the blood. This way of application helps the progesterone to be “time released” into the blood stream. To mimic the body’s progesterone cycle, it is best to use progesterone cream twice a day. When it comes to dosage, more is not better. Too much progesterone can cause hormonal imbalances, just like too little can. General suggested dosage is 15-30 mg during the two weeks before your period. Begin using progesterone directly after ovulation which is usually day 12 – 14 in our cycles and ending usage once menstruation begins. Once you become pregnant, stay on the progesterone and contact your healthcare provider. A loading dose is useful for women who have had many months or years of anovulatory (no ovulation) cycles, which can create extreme progesterone deficiency. Each cycle that passes without ovulation can increase estrogen dominance as progsterone stores are depleted. Very thin women who have little body fat can become estrogen dominant very easily s there is not fat to store extra progesterone. In either of these situations, use a higher dose of progesterone the first one to two months of progesterone cream use. This helps to replenish the progesterone stored in the fat of the body. After 2-3 months the dose can be lowered to the usual dosage. 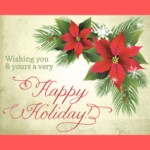 Use natural progesterone from days 5 – to 26 in the cycle (stopping on day 26 to bring on menstruation). Using the progesterone prior to ovulation effectively suppressed ovulation. After a few months of this, stop progesterone use. If you still have follicles left, they seem to respond to a few months of suppression with the successful maturation and release of an egg. Progesterone cream can help to oppose the estrogen dominance that occurs with PCOS. By using progesterone cream you are able to mimic a natural cycle and help the body to establish its own cycle, including ovulating again. With progesterone cream, changes in diet and exercise, PCOS could become obsolete. There are two ways to use progesterone cream for PCOS. The first is the suppression cycle. To suppress the cycle one would use progesterone cream on cycle days 7-26. If you do not have a menstrual cycle you would choose a date on your calendar and mark it as day 7. Suppressing the cycle allows the body to rest by stopping the cycle of eggs not being released and estrogen/androgen dominance. Use 60-100mg of progesterone cream a day during the suppression cycle and repeat this for 3-4 months for best results. To help your body create a cycle including menstruation and ovulation, use progesterone cream on day 12 of your cycle and continue until day 26. By stopping on day 26 your progesterone levels will drop, helping to start your menstrual cycle. If your cycle does not start, just treat your cycle like you are having one and start again on day 12. It is best to use a calendar so you can keep track of everything. After 3 or so months it is suggested to take a break for 1 month so you can see if yur cycle has jump started itself. If you have endometriosis, use progesterone from days 8-26 of your cycle to reduce the effects of estrogen on the body (estrogen stimulates endometrial growth). Take a short week off to refresh your receptor sites. Once the outbreaks of endometriosis are tolerable reduce the usage to days 12 till menstrual cycle. Natural progesterone is safe to use during pregnancy with the consent of your doctor or midwife and may prevent first trimester miscarriages that are due to low progesterone but should be used with caution when nursing as it may stop lactation. In the first trimester of pregnancy progesterone is the sole responsibility of the ovaries, but they often fail to produce sufficient levels to maintain the pregnancy. By the second trimester, the placenta itself is responsible for producing progesterone and it hikes the level of this hormone to 486% higher than the non-pregnant norm. If you are taking progesterone and get pregnant, you must continue taking progesterone until at least the 16th week. Work with your practitioner; they will monitor your levels to make sure they are healthy for pregnancy. If you become pregnant, continue to use the cream and consult with your doctor or midwife right away. Cinnamon is one of the world’s most beloved spices, but did you know it has useful benefits for fertility as well? It has been used for years to curb heavy menstrual bleeding (menorrhagia), including heavy bleeding due to endometriosis and uterine fibroids. Over the last 10 years it has been used to aid women with insulin resistance associated with PCOS and those with type 2 diabetes. Resistance to insulin increases the body’s insulin levels. A pilot study showed cinnamon to greatly reduce insulin resistance in women with PCOS. 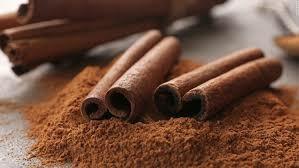 The study showed that cinnamon reduced insulin by increasing phosphaidylinositol 3-kinase activity in cell function. Half of the women who took part in the pilot study took cinnamon extract for 8 weeks, while the half of the women took a placebo. After the 8 weeks period, both groups of women were tested using fasting and 2-hour oral glucose tolerance tests. The group who took the cinnamon had greatly reduced insulin resistance compared to the placebo group. Another study showed cinnamon to improve glucose levels in type 2 diabetes patients. The double blind study used 79 patients who normally managing their diabetes with diet, or medication like Metformin, a medication often prescribed for PCOS patients as well. Patients were randomly assigned to take 1 capsule, 3 times a day of cinnamon (equal to 3g. or 1 tsp. ), or a placebo for 4 months. At 40 days fasting glucose levels were taken; patients taking cinnamon had a significantly reduced level of 10.3% compared to 3.4% in the placebo group. These findings are promising to PCOS patients because of the similar insulin resistance associated with both type 2 diabetes and PCOS. One study suggests cinnamon may also reduce insulin resistance by slowing the movement of food from the stomach to the small intestine. This slows the breakdown of carbohydrates, which is important for people with diabetes and women with PCOS. Research at the Human Nutrition Center at Tufts found that cinnamon triples insulin’s ability to metabolize glucose (blood sugar), protecting people against diabetes, lowering hunger, lowering sugar cravings, while increasing weight loss. Weight loss is often a difficult part of living with PCOS. Many women find that losing weight is next to impossible when living with PCOS. Cinnamon may be one natural way to improve weight loss in women with PCOS. Lowering insulin resistance before PCOS turns to type 2 diabetes is important. Cinnamon may help, along with specific diet changes for PCOS and diabetes. why is insulin resistance a problem for women with pcos? Insulin resistance affects normal ovulation by preventing he body from ovulating or limiting the maturation process of the released egg. Women who are insulin resistant are also 4-5 times more likely to have a miscarriage. Imbalanced insulin levels due to PCOS make it difficult for the embryo to attach properly to the uterus. 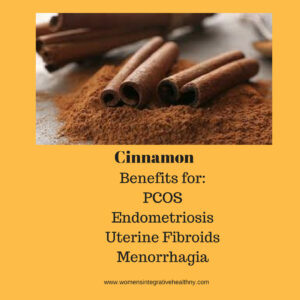 Cinnamon has been shown to be a useful tool for women with heavy menstrual bleeding associated with endometriosis, uterine fibroids, adenomyosis and primary menorrhagia. Cinnamon has bee used traditionally for hundreds of years to stop excessive menstrual bleeding, hemorrhage during childbirth and miscarriage and today for any fertility condition where heavy menstruation is present. Cinnamon taken internally may curb heavy bleeding. Endometriosis is when excess endometrium lining of the uterus that normally grows in preparation for implantation of the egg does not completely shed during menstruation. It then begins to attach to other places of the body besides the uterus. When menses comes not only does the lining in the uterus bleed, the endometriosis that has grown in other places of the body also bleeds. Some women with endometriosis have abnormally heavy bleeding or long-term menstrual bleeding. Uterine fibroids are lumps of tissue that form on the uterus or within the uterus. They may cause excessive mentrual bleeding. Most women who are experiencing excessive bleeding during their menstrual cycle have ovulatory dysfunction, in other words, they are not ovulating correctly. This is most often due to hormonal imbalance. Traditional Chinese Medicine and Ayurveda has used cinnamon for thousands of years to bring warmth to a cold uterus. A cold uterus is defines as boggy, congested, poor circulation and menstrual irregularities, including PCOS, endometriosis, uterine fibroids, amenorrhea of for women with sedentary lifestyle. The increased circulation and warming effect also may help reduce menstrual cramping. Cinnamon may also help to prevent yeast infection. High blood sugar levels increase the risk of chronic yeast infection (Candida overgrowth), remember that cinnamon helps to lower blood sugar. Dried bark powder: 1 heaping teaspoon in 1 cup hot water per day or 3 capsules right away, then 1 cup two more times that day. Tincture: 115 drops right away, 3 drops two times in the day after that. Note: only to be used this way during heavy bleeding times. Not to be taken at high doses long-term, may be caustic to the mucosal lining of the digestive system. Cinnamon is a slight blood thinned – it is best not used by those on blood thinning medications. For more info on fertility and how we can help can be found here. High FSH levels can be a sign of poor ovarian reserve, poor egg health and quality and a symptom of failure to ovulate (anovulation). A recent study of 560 women who sought fertility treatment at the Yale University IVF program and the Montefiore Institute in New York revealed that blood type may play a factor in fertility. According to this study women with blood type O have, on average, higher FSH levels when compared to other types (A, B and AB). The researchers discovered that women with blood type O were twice as likely to have an elevated FSH level of above 10 (which is right on the cusp of fair to diminished ovarian reserve). The study also found that women with blood type A were the least likely to have elevated FSH levels. 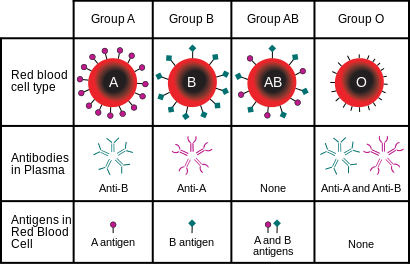 The reason suggested was that women with blood type A carry a antigen which is missing in blood type O. How can you lower high FSH levels and produce higher quality eggs? First and foremost is optimal nutrition with adequate intake of protein, good fats and complex carbohydrates. Iron and vitamin E are crucial for healthy egg development and maturation. Many women are low in iron which leads to general fatigue, pallor and heavy periods. The herbs Shatavari, Dong Quai and Rehmannia have traditionally bee used to treat poor egg quality and are often prescribed to women in their late thirties ad early forties. Consider having a Anti-Mullerian hormone test. This test will show you what level of ovarian reserve you have (the amount of primordial follicles you have left). This will indicate whether low ovarian reserve may be a cause of your elevated FSH levels. Consider some dietary adjustments. It has been suggested that type O’s eat a predominantly paleolithic diet, which is largely meat based, and that they avoid dairy and wheat (gluten). Negative effects of dairy and gluten on human fertility have been well documented. For example, the first country to country comparison study found that fertility declined with age faster in countries where women drank a lot of milk than in countries where they drank lower quantities of milk. Similarly, women with undiagnosed intolerance to gluten are more likely to experience difficulties getting pregnant and to enter menopause earlier. One large study found that following a diet high in animal protein may in fact increase your chances of ovulatory infertility. According to a study from Harvard, the longest running study of woman’s health in America which started in 1976 and initially included over 120,000 married 35-55 year old female nurses – ovulatory infertility was 39 percent more likely in women with the highest intake of animal protein then those with the lowest. The same Harvard study found that replacing 25 grams of animal protein with 25 grams of plant protein would lower your risk of ovulatory infertility by 50%. O blood types should consume adequate amounts of iodine or sea algae (Kelp) as it acts as a blood tonic for O blood types and as such has a medicinal effect. What’s interesting to not is the fact that iodine, selenium and zinc (found in Kelp) are crucial for healthy thyroid function. Ovaries have recepters for thyroid hormone thyroxine, which is required for follicle production. For more help with egg quality and fertility issues, contact us below. Could What You Are Eating Be Making Your Eggs Old? Have you ever considered that what you are eating may be aging you faster and therefore leading to poor quality eggs and the diagnosis of “OLD EGGS” – making your eggs old? I have talked to so many distraught women who have been told their eggs are too old for conception. Some of these women are in their 40’s and some are still in their 30’s while some are just in their 20’s! Many of these women go on to conceive with their own eggs and give birth to healthy babies despite this poor outlook. Those who do make some changes to their diet and lifestyles and followed them religiously for a minimum of a year. One substance has been on the research radar for years. It’s been linked to tooth decay, acne, diabetes, weight gain, poor immunity, ADD (attention deficit disorder), hyperactivity and aggression, cancer proliferation and now aging! SUGAR! Want to know how to increase sperm naturally? Actually – sperm quality? 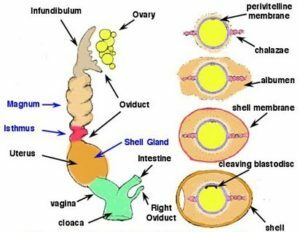 The motility (movement) and the morphology (shape) of the sperm is just as important for fertilization of the egg. If you have been wondering if you have a ‘normal sperm count’, it may be a good idea to have a test done for evaluation. Your body can always use some extra help through nutritional and lifestyle choices as this can go a long way to help increase your sperm count and quality! As part of a preconception care plan, it is always helpful to get a routine check up. Letting your doctor know you are trying to conceive is helpful so they can discuss any relevant information you may need to know. There are certain medical conditions that can interfere with reproductive function so these need to be ruled out, addressed or monitored. The spermatozoa take around three months to mature, although they are constantly being produced. If you have had the flu, an infection or fever within the last few months, this could affect your current sperm quality. Likewise any negative lifestyle factors can also impact your sperm cells. How to increase sperm count? 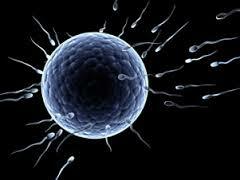 Your body can do with some replenishment and ‘TLC’ to help restore the quality of your sperm. Your sperm supply should be completely regenerated after around three months time. Eat fresh organic fruits and veges – these are full of essential vitamins, minerals and antioxidants (must be free of pesticides and other chemicals that damage sperm). Proteins – eat more seafood and vegetable proteins rather than meats. Organic lean meats/poultry/eggs and dairy – check packaging labels, must be “hormone free” (as these can significantly contribute towards hormonal imbalances). Saturated fats (mostly from animal sources) – limit daily intake. Trans fats (avoid totally) – liquid oils that are made into solid fats, often found in packaged products or fast foods (check all labels). Eat unsaturated fats which include the essential fatty acids (the good fats) – these are found mostly from vegetable sources (except omega 3) – incorporate these into your diet. (EFAs) Omega 3 found in oily cold water fish. (EFAs) Omega 6 present in nuts, seeds and vegetable oils. Whole grains, nuts, seeds and legumes/pulses – are all high fiber, protein and help keep your digestive system functioning smoothly. Avoid refined foods such as white flour or white rice. Also avoid processed foods and soda drinks – these are full of unhealthy preservatives, additives, sugars, excess salt and fats, so best to be avoided. Filtered water – is best as normal tap water can contain traces of heavy metal and chemical residue, make sure you drink at least eight x 8-ounce glasses per day or more if exercising. A fertility diet is highly recommended as it can help re-balance the hormones that are necessary for reproductive health. We can help with what is helpful for a fertility diet. Contact us below and we would be happy to give you some guidance. How can we facilitate healing after pregnancy loss? First, losing a baby is no easy thing. It shakes your world. It can break your heart. The due date will come and go and can be a challenging time once again. When a close family member had a loss, I came face to face with the depth of that experience. We were making plans, filled with lots of excitement. Then loss happened. Our hearts were shattered. Healing from pregnancy loss is no easy task. As a “Fertility Doula”, I quickly came to realize that when you are in labor, you have to process all previous losses before being able to open and delivery this baby. Many of my clients come to me after numerous losses through IUI or IVF. Each time they have conceived and I was privileged to be present during their birth, we had to go through a process of grieving and accepting all previous pregnancies or possibilities of pregnancies. Sometimes we worked on this prior to the birth process, and sometimes it is during the birth process. So how do we move through loss and at the same time move down the path to motherhood? Here are some tips for you to try so you, too, can move through miscarriage and shift your energy as you continue on your path to motherhood. Connect with your body. Go inward on a daily basis and give yourself the opportunity to see which parts of you may have something to say. Tune in to things like – is your stomach in a knot? Are your shoulders tight? Is you chest feeling sunken in? All of this information will give you insight into what your physical body is hanging onto stuck energy. Invite breath into those areas to help get the energy moving once again. Connect with your whole self – physical, emotional, mental and spiritual. When all of these are not connected you are more likely to feel fear, disconnection and judgment of yourself and those around you. A lack of flow in our energies in our systems can make this happen. Make sure there is enough room for all aspects of you so that different feelings don’t rule and take over your energetic space. As space is given to the different aspects of yourself, energy will shift and flow. Acknowledge your thoughts and remember that energy follows thought. If you are filled with fear about having a miscarriage, do what you can to work through this fear. Affirmations are great for working through this process. A helpful one may be – “I trust that my body knows what to do”. You can find more helpful affirmations here! If you don’t trust your body, start with saying loving affirmations towards your body such s, “I choose to send love and appreciation to every part of my body.” Small changes can make a huge difference from an energy medicine perspective. Make sure you feel and process all of your emotions. Emotions are energy. When an emotion arises, even if it is difficult and challenging, be with it. It has something important to tell you. When you allow space to process your emotions, you can move the energy. You may be in resistance if you are looking for distractions or not wanting to process your emotions. This creates energetic blockages. Owning your emotions and not blaming others is the key. It’s powerful when you do and will help to move the stagnant energy. Having a goodbye ceremony may be helpful. Oftentimes when there is a loss, we hang on to the person who is gone from an energetic perspective. This also creates stagnant energy. Have a goodbye ceremony to honor your time with your baby that you miscarried. This ceremony can help to create a sense of closure and help to free up energy for a new baby to arrive. Contact me for info and help creating a Blessingsway of some other form of ceremony if you think this may be helpful to you. Find a safe person to talk with about the miscarriage. A therapist, energy practitioner, friend or relative who is good at listening may be helpful. Feeling safe as you talk can help to move stagnant energy. Balance and align your chakras, the main energy center in your body. I have included a fertility chakra meditation for you to listen to. I have also included an Yoga Nida meditation for your use for relaxation as you move through this process. As you begin to move through this process, tend to your body, mind and spirit in a loving way. This will help create a positive energy from which to heal. I am available to talk or help facilitate you through this process. Let me know if I can help. Part of the Top 40 Hormone Blogs! Lisa was so helpful and supportive while we were trying to get pregnant after our son was stillborn and then miscarried, she then continued onto my prenatal and postpartum doula. She kept my mind at ease and supported all my decisions. I recommend her to all my friends struggling with infertility or pregnancy! Wow – I can’t believe you were able to help me to relax! I haven’t been able to relax in months! And now – I’M PREGNANT! After so many miscarriages, failed attempts, we are pregnant! Having Lisa was a LIFE SAVER. She is truly amazing. I don’t know how we would have done it without her! Thank you for giving me my life back! The hormone protocol you gave to me has made amazing differences in how I am feeling. I have so much more energy, am sleeping better and have lost all the belly bloat I was experiencing. Thank you! Want to know how to balance hormones naturally? If you’re a woman who suffers from bad menstrual cramps, acne, anxiety, insomnia, mood swings, chronic fatigue and/or feelings of exhaustion, weight gain, mood swings, and lack of sleep; hormone balancing might be the answer to all of your problems. Has this contributed to fertility issues, gut and thyroid issues? We have answers and can help bring your hormones back into balance today and put the bounce back into your daily life! We have specialized programs designed to get to the root cause of these issues and get your body back into balance. Appointments are available locally in Saratoga and Queensbury. 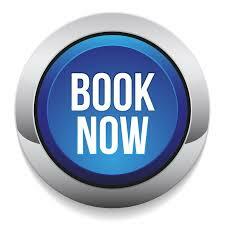 Online appointments are also available from anywhere via skype or by phone.